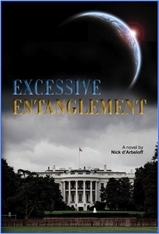 Excessive Entanglement is a riveting new political thriller, described by one reviewer as "Michael Crichton meets West Wing." While taking the reader on a wild, action-packed ride from Washington DC to Beijing to the L5 Spaceport, the book gives readers a front row seat as opposing political forces battle for control of a brand new world. President Virginia Belknap is one year into her second term when a NASA scientist discovers a new planet with an atmosphere similar to Earth. Embracing the event, Belknap turns a one-way mission to colonize this new world into her grand calling. The mission seizes the world’s imagination. But as the coolheaded and competent Belknap starts to assemble experts from different nations to plan all aspects of this enterprise, religious conservatives—led by an earnest evangelical named Randall Reese—rise up in outrage and indignation. They view Belknap’s plan as the blueprint for the Godless perpetuation of the human species. As the political machinations of Reese and others put the launch at risk, a broader and darker conspiracy takes shape that threatens to obliterate the ship, its crew, and even the new planet itself. Belknap, her own life in danger, is forced to battle Reese, expose the conspiracy, and regain control of the mission before the launch window closes. But not before mankind’s first opportunity to create a more perfect world from the ground up devolves into a political bonfire of deceit, murder, and domestic terrorism.